I wrote recently about the importance of reading aloud to young children. In that post, I encouraged you to get an anthology book – such as The Read-Aloud Handbook by Jim Trelease or Honey for a Child’s Heart by Gladys Hunt. 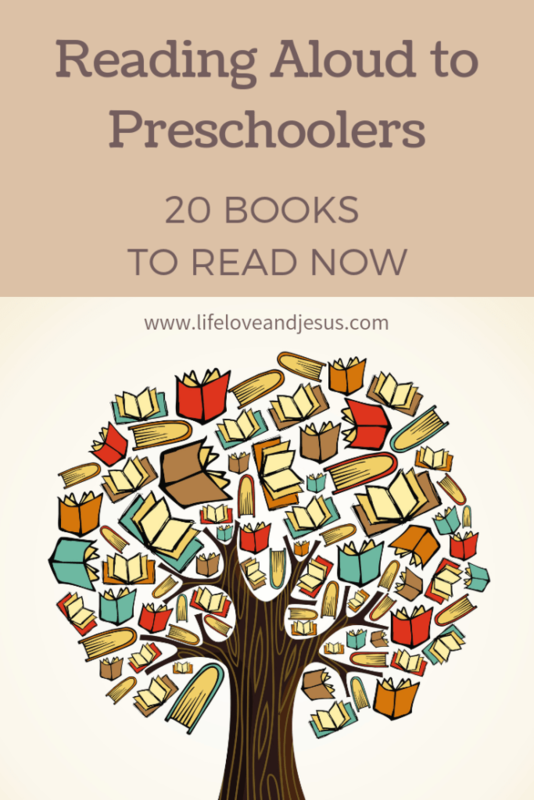 However, I’m also giving you my own suggestions with this list of 20 books to read aloud to your preschooler. Because reading aloud is so critical to young children, I have focused on that age group. But, I plan to eventually write posts about reading aloud to older children, reading with children, and more lists of 20+ favorites for every age group. In all this talk of reading aloud, don’t neglect to read aloud the Book of books – the Bible! I love children’s books. I love reading them. I love looking at the pictures. I imagine that one day my love of children’s books might result in actually writing one. But for now, I content myself with reading, rereading, and discovering wonderful new books. Sometimes I think I should have been a librarian – a children’s librarian, of course – instead of a teacher. Given my love for children’s books, coming up with my favorite 20 books for preschoolers is a daunting task. Any list of books compiled by anyone will inevitably leave off someone’s favorite. I may leave off your favorite, or you may be pleasantly surprised to find it listed here. I hope, however, that if you are unfamiliar with any of the books on this list that you will find a copy at your local library and read it – preferably to a preschooler – before passing judgment on leaving off your favorite. For the sake of my sanity (I couldn’t even imagine trying to place them in order from least favorite to most favorite! ), I am listing this treasury of 20 books in alphabetical order. I hope you will find a new favorite today. All of them are well worth reading and rereading to the young children in your life, but Brown Bear is the first and most well-loved of the series! Introduce the alphabet through their antics of climbing a coconut tree! Will there be enough room for all 26 letters? A favorite of preschool and kindergarten teachers with good reasons, I’ve read it dozens of times to children in my life, and it is always a pleasure. Love, love, love the Click, Clack, Moo animals in all their versions (including Duck for President). Fun, cute, and thoroughly enjoyable, Click, Clack, Moo, Cows That Type was the first in the series. The first of Beatrix Potter’s well-loved classics, the Tale of Peter Rabbit has endured for more than a century. Ms. Potter wrote 23 stories in the series, including such characters as Jemima Puddle-Duck, Benjamin Bunny, and Squirrel Nutkin. Don’t miss any of them! The original classic about a curious little monkey and the man in the yellow hat, Curious George is not to be missed. Although the sequel, TV show, videos, and stuffed animals are all great, none match the magic of the original story. Best if read aloud in an appropriately cute but demanding voice, the Pigeon books by Mo Willems – of which the bus book is the original – are highly entertaining to preschoolers. They love answering back to the pleading and bargaining from the Pigeon. Another classic that celebrates the joys of friendship. All the Frog and Toad books are worth reading, not once but several times. The stories delightfully told and the understated illustrations just right. As a bonus, the lessons the stories convey, about being supportive of friends, keeping your word, and encouraging each other in tough times among others, are just what young children need to learn to build social skills. I read Green Eggs and Ham to my boys countless times – until they could read it themselves! Or at least had it memorized. It was a favorite request at bedtime, partly because of the rhythm and rhyme, partly because of the predictability, and partly because of its familiarity. Of course, any book by Dr. Seuss comes highly recommended. The mouse that started it all, these entertaining circular tales (including If You Give a Pig a Pancake, If You Give a Moose a Muffin, and If You Take a Mouse to School), are perfect for keeping your child begging for more. Get them all and soon your preschooler will be reading them to you! More than 90 years old, these two originals – before Disney – are still heart-warming, tender, and priceless. While giving the Disney version of Winnie the Pooh a special place in your home, don’t neglect these treasures. One of the current favorites for my oldest grandson, the sweet story of a Little Blue Truck that knows the true meaning of friendship, helpfulness, and forgiveness, is one I suspect he will soon memorize! There are several more books in the series, all worth your child’s time. An engaging storyline with a mouse who doesn’t want to lose his strawberry to the big hungry bear! Interest is kept high by involving the reader in the story. A perennial favorite. Starring a baby boy – who grows throughout the book – and his mother, I read and reread this book to my boys countless times. It is a testimony to the power of love and the bond between mother and child. Additionally, the oft-repeated phrase, “Love you forever, like you for always, as long as you’re living, my baby you’ll be,” is one that young children learn by heart quickly and love to ‘read’ it with you. Jan Brett’s books are simply beautiful. The artwork by itself will engross you and your children for a delightfully long time. The Mitten is Jan Brett’s retelling of a Ukrainian folktale. The Hat, a companion but original story, is equally charming. I love all her books and own most of them! Read repeatedly to my children – who delighted in the ending – I didn’t realize this book was still in print until I was researching this post. It is a fun, light-hearted book, starring lovable little Grover from Sesame Street. Grover talks directly to the reader, pulling the child into the book. Not great literature, but still worth reading for the sheer joy it brings. The only Christmas book to make my list, The Polar Express is a not-to-be-missed joy. Some of Chris Van Allsburg’s books are difficult to read with deep lessons (The Wretched Stone is one), but The Polar Express does not fall into this category. The magic of Christmas and the mystery of belief are on full display in this classic. Don’t be tempted to say, “I’ve seen the movie, so I don’t need to read the book.” While the movie is wonderful, the book is a treasure of its own. The beauty of friendship and the power of generosity are on full display in this classic tale of a fish who is a bit too proud of his shiny rainbow scales. By the end of the book, however, he realizes he’s been a bit of a snob and learns to be a good friend instead. I never read this book to my children, because it wasn’t written yet! But I’ve no doubt that they would have loved it. The magical world of snowmen who come alive while the rest of the world sleeps is wonderfully told in rhyme, while the brilliant illustrations bring the text to life. The antics of the snowmen are continued in other books in the series, including Snowmen at Christmas and Snowmen All Year. The tale of the spirited young duckling who lives on a boat on the Yangtze River has delighted both parents and children since 1933. While Ping is worried about getting a spanking for being the last duck on the boat, he soon discovers things could be much worse. The next day – after many adventures – he willingly accepts his spanking and is glad to be home. An instant classic when first published more than 30 years ago, The Very Hungry Caterpillar eats his way through the days of the week. Along the way, he munches all sorts of goodies, growing bigger and plumper along the way. Will he ever stop eating? Plan to read this book multiple times in your child’s life. Anything by Eric Carle is highly recommended as well. Enjoy this precious time – read aloud every chance you get!